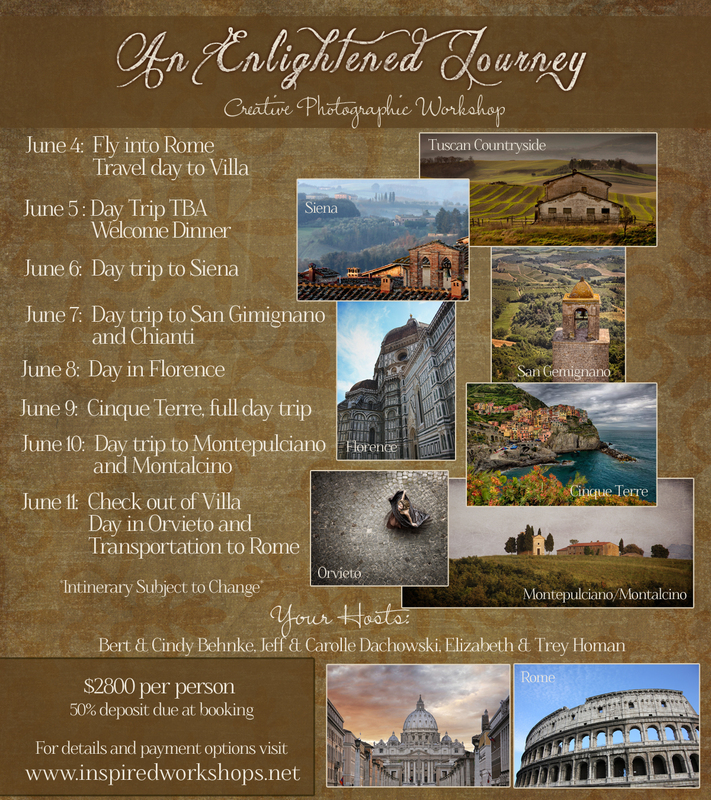 Inspired Workshops: Workshop in Tuscany Itinerary is HERE! Workshop in Tuscany Itinerary is HERE! ONLY 25 PEOPLE can attend! Be ONE of the TWENTY-FIVE! Saturday: Arrival Day. Villa is open to us beginning at 4pm. There will be transportation available from Rome to our Villa in Tuscany. Sunday: Those who arrived Saturday will have a DAY trip planned (optional). If you are unable to arrive until Sunday, please let us know. Enjoy a Welcome Dinner at the Villa on us. Monday: Start the day off right with a SUNRISE SHOOT. Breakfast at the Villa then a wonderful Day Trip to Siena. Dinner on our own in Siena. Tuesday: Half Day in San Gimignano and Half Day in Chianti with Winery Tour. Dinner at the Villa on us. Wednesday: All Day in FLORENCE. Hang with the group or explore on your own. Meet up for dinner at a fabulous local restaurant (optional and not included in price). Thursday: EARLY START as we head to the Cinque Terre for the Day. If time allows, we may hit Lucca and Pisa on the way. SUNSET SHOOT of the amazing CINQUE TERRE. Dinner on your own. Friday: SUNRISE SHOOT, Breakfast at the Villa and then we head out to Montepulciano and Montalcino (The amazing Brunello Region). Hoping to secure a Cooking Demo and Dinner. Saturday: Check out of the Villa early to spend the DAY in ORVIETO. Goodbye Lunch/Dinner (tba) in Orvieto. Transportation to Rome that afternoon/evening. Or you can stay in Orvieto or be on your way to any other exciting excursion. The choice is yours! Transportation To and From Villa each day, Transportation to and from Orvieto. All Sunrise and Sunset Shoots PLUS any other impromptu shoots that happen along the way. 6 World Class Instructors who are willing to share anything and everything with YOU! All Activities are OPTIONAL. While we would love for everyone to join us for all of the day trips, we understand that some may not enjoy our Sunrise Shoots. Sleep in, enjoy coffee and we will meet you back at the Villa before heading out to explore the area! Really amazing thanks for sharing this with us ,It is incredible. I truly like to reading your post. Thank you so much for taking the time to share such a nice information. Such a wonderful place to visit. All the pics are amazing. I also want to go there and i think first i need to learn the language so that i can do fully enjoy there. Thanks for sharing us.